What are one-size diapers like? One-size diapers are adjustable in length and girth to fit babies from 8 or so up to around 35lbs. Many cloth diaper users like one-size diapers for this flexible range of size, which allows more than one age of child in a family to use the same diapers, or one child to wear the same diapers "from birth through potty training". There are some tradeoffs that come from this flexible sizing, though, as when adjusted to fit small babies they tend to be so bulky that the child may seem swallowed up by diaper, and when adjusted for toddlers the diapers usually have multiple hard snap parts showing on the outside. Fit is dependant upon the ability of the diaper to match the size and shape of the child at any given time, and can be hit and miss. One-size diapers do not function as pull-up diapers. 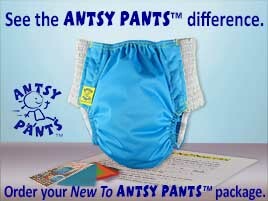 So how do Antsy Pants™ compare to one-size diapers? Antsy Pants™ do not come in an AIO version at this time. Each of the sizes does, however, fit a broad range of shapes and sizes of children well with a comfortable fit across a wide range of circumferences. It is unlikely that a child would need two sizes of Antsy Pants™ unless the first set was used for diapering without trying to teach potty skills.